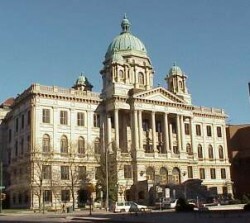 We have an active full-time law practice which extends across the may courts and into the courthouses of New York State. We handle legal matters from Buffalo to Albany, from Watertown to Binghamton, and from Plattsburgh to the Hudson Valley. The central location in Syracuse gives us easy and ready access to just about every place in upstate New York. Raymond J. Dague is an attorney in Syracuse, New York in the practice of law since 1979 when he was admitted to the New York bar. For more than 33 years his law practice has extended through and beyond the central New York area. He appears regularly in Onondaga County in the supreme court, county court, surrogate’s court, family court, Syracuse city court, and the justice courts in the various towns and villages. Locally his federal court practice covers the federal district court for the northern district of New York in Syracuse, Utica, Watertown and Binghamton where he handles civil, criminal and bankruptcy cases. Beyond Onondaga County he regularly practices in the New York state courts of the adjacent counties of Oneida Rome and Utica), Oswego (the cities of Fulton and Oswego), Cayuga (Auburn), Madison (Wampsville), and Cortland (City of Cortland), Jefferson (Watertown), Lewis (Lowville) and often in other counties when the need arises. He has filed and argued appeals to the 4th department supreme court appellate division which sits in Rochester. It is not uncommon for us to be on the road each week to cover the courts in the rural counties within upstate New York. Beyond the central New York area he is admitted to and practices in the federal district court for the Western District of New York which sits in Rochester and Buffalo, the federal bankruptcy court in Rochester, the federal district court for the Southern District of New York which sits in New York City, to the federal second circuit court of appeals which sits in New York City. In 1996 he was admitted to the United States Supreme Court bar on the same day when one of his cases was argued.